Have you ever had prosciutto? The very expensive thinly-sliced Italian ham that melts like butter in your mouth? You can make that, right here in Churubusco, and the taste of it would make an Italian prosciutto maker gnash their teeth with envy. If there’s one thing we Hoosiers know, it’s pork! I grew up with what we called home-cured ham. It’s also called country ham or salt-cured ham in other places. We’d butcher pigs in the fall. Grandma or Mom or Dad would rub a ham with salt and spices and hang it to cure. In the spring we’d cut the ham down and eat it. Most often we’d slice it about ¼” thick and fry with hominy. 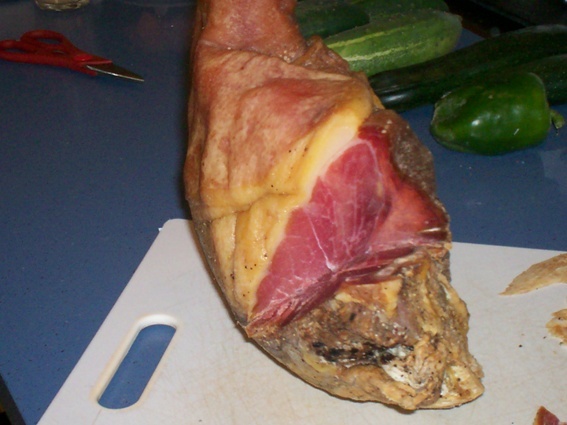 It wasn’t until many years later I came across prosciutto and read about it how it was made. The realization was stunning. The prosciutto I’d been paying so much for was nothing different than the hams Grandma cured! Curing a ham is the process of preserving it by covering it with salt, spices, and nitrates or nitrites. The salt and nitrates/nitrites prevent the growth of bacteria that would spoil the meat. The nitrates/nitrites are also what turns meat the pink color we associate with ham, bacon, or corned beef. To cure a ham start with a fresh ham. That’s a ham that hasn’t been cured or smoked. You won’t find a fresh ham in the meat counter at the grocery store, you have to order them. A quality meat counter like Egolf’s IGA in Churubusco, or a meat processor like Krider’s in Columbia City can get you a fresh ham. You can cure a half or a whole ham. When curing a ham this way it’s best to start in the winter, so the cure takes effect before the meat spoils. Mix spices together thoroughly. It is important to distribute the salt petre evenly. Lay the ham on a cut apart brown paper grocery sack. Rub spices over entire ham. Work them into any folds in the meat and pack around the bone end. Wrap the brown paper around the ham and carefully slip it into a clean cloth bag, bone end first. That’s right. This recipe takes a raw piece of meat and hangs it at ambient temperature for 9 months. And then you take it down and eat it. You don’t even need to cook it first. That’s what prosciutto is, slices of raw cured ham. The curing process makes the meat safe to eat without cooking it. When you take the ham out it likely will be covered with mold. That’s normal. Put it in the sink and give it a good scrubbing with a coarse brush. You can cut slices that are about ¼ inch thick to cook and eat like any slice of ham. Soaking the slices in water for a while will make them tenderer and remove some of the saltiness. The ham is much more intensely flavored than a store-bought ham, so one small slice is plenty for a serving. You can also slice it paper-thin and eat it like prosciutto; a slice as an appetizer, on a salad, or in a sandwich. After you’ve cut all the slices thick or thin that you can, you’ll have the bone and some odd shaped pieces of ham left. These are wonderful as the base for a soup. It works well to put the bone in stockpot, cover it with water, bring it to boil, and then discard the water and start again. The broth will be clearer and not as overwhelming salty that way. Curing a ham was a way to preserve meat in the days before refrigeration. It used to be what poor country people ate. Now it’s a luxury item, one you can make and try yourself. Would you take the high road if you could choose? -- John Mellencamp, in "Your Life is Now"